The iPad Air was released last week, and pretty much conformed to every leak we’d heard; it featured slimmer bezels, a 64-bit A7 chip, and the same 9.7-inch screen we’d grown to know and love. The iPad Air, as Apple claimed, represented the biggest step in iPad innovation since the original iPad was released. With that said, you would be forgiven to think that the iPad Air would be in short supply come its release tomorrow on Friday 1st November. In fact, according to a new report, the new device will be very easy to come by as stock is plentiful. Sources claim that Apple Stores and other retailers across the world have already begun receiving large shipments of the iPad Air ahead of the launch on Friday. 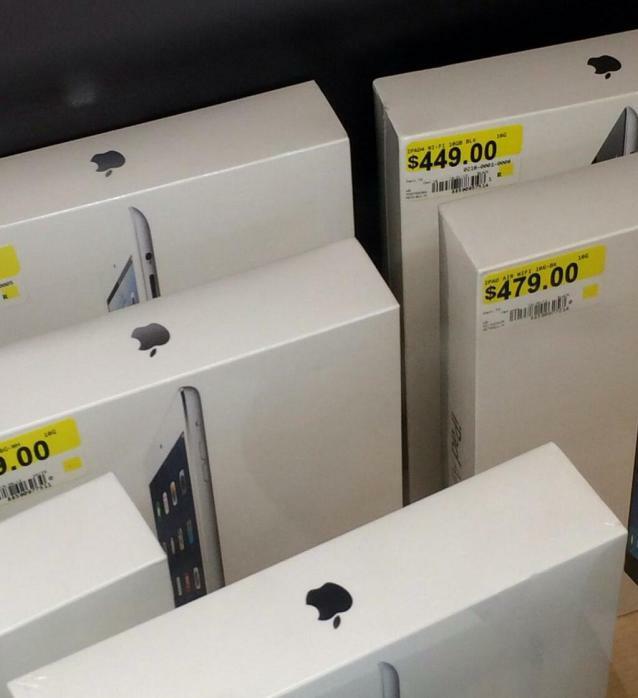 Images are also appearing on the Internet of the stockpiles of iPad Air’s waiting to be sold tomorrow. This was was captured of a Walmart showing the device already with pricing inside a glass cabinet. It appears that the shipment sizes that the Apple Store and other retailers are receiving are coming in at between 500 and 1000 iPad Air units per store. That’s a whole lot of stock, which reinforces the belief they’ll be plenty available for everyone. Perhaps Apple have already learnt from the crazy stock situation that the iPhone 5S did and is still experiencing. Or perhaps it’s just because the iPad Air really only takes the iPad Mini and repackages it into a bigger screen? Either way, plenty of stock is a good thing so come Friday 1st November, you’ll either be able to order it online starting at 12:01am and wait for it to ship, or you can visit an Apple Store or other retailer when they open at 8am. We’re yet to see if Personal Pickup will be offered as an option. Will you be picking up an iPad Air?